We're a New England based professional Las Vegas Casino Night event & entertainment rental company. 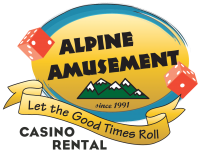 Founded in Vermont, Alpine Amusement has been providing Casino Grade equipment to corporate event planners, non-profit organizations, and private functions in the Maine, New Hampshire, Vermont, Rhode Island, Massachusetts, Connecticut, and northern New York region since 1991. We have all your favorite casino games like Craps, Roulette, Blackjack, Texas Hold'em, and The Money Wheel.